This time, we introduce the Teppanyaki restaurant “Yoshihiro” which is located just 4 minutes from SEKAI HOTEL FUSE. I interviewed the owner of the restaurant which has a long history. It has been 70 years since the restaurant opened in 1948. 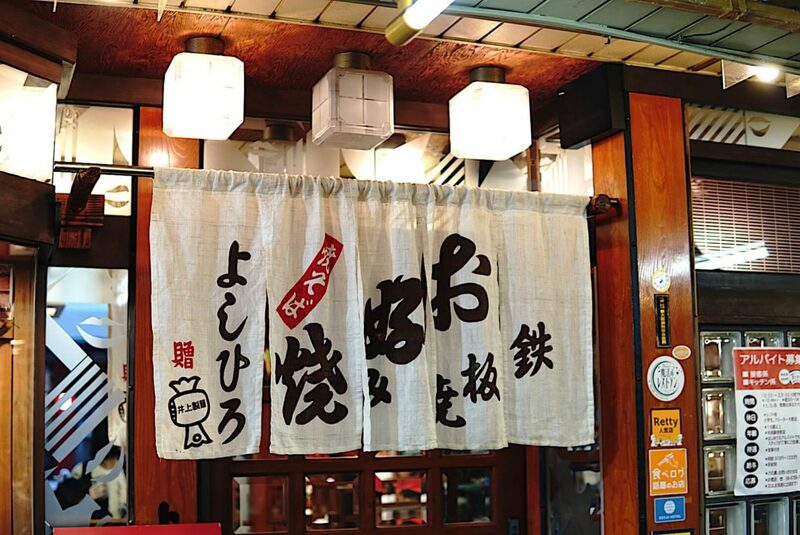 I found the shop curtain with the letter Teppanyaki “Yoshihiro” on our way to look for the restaunrant ! 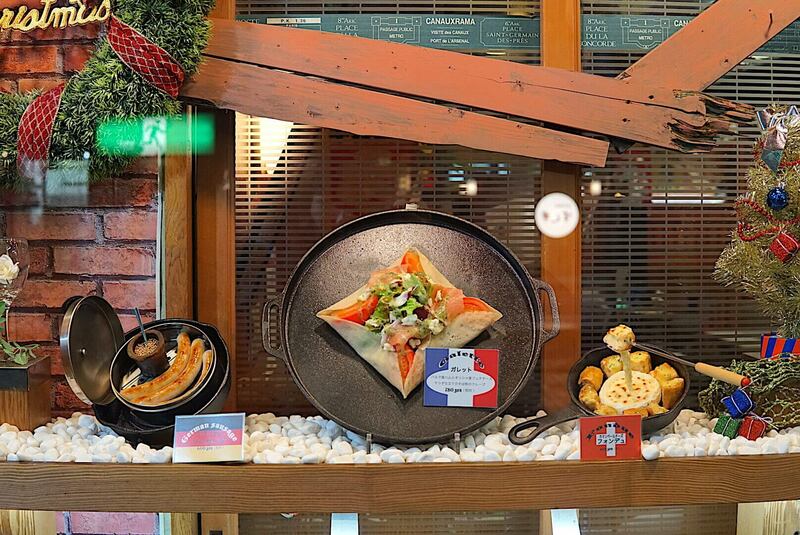 We can see French galette and German frankfurt in the showcase. I wondered why. Anyway, I just entered the restaurant. They have 48 seats, and it is spacious. They play American music, and inside was nicely decorated because it was the Christmas season when we had an interview. That’s quite different from images of typical Japanese Teppanyaki restaurants. There are various kinds of customers such as elderly woman comes by herself, business person in break time, local young guys and so on. 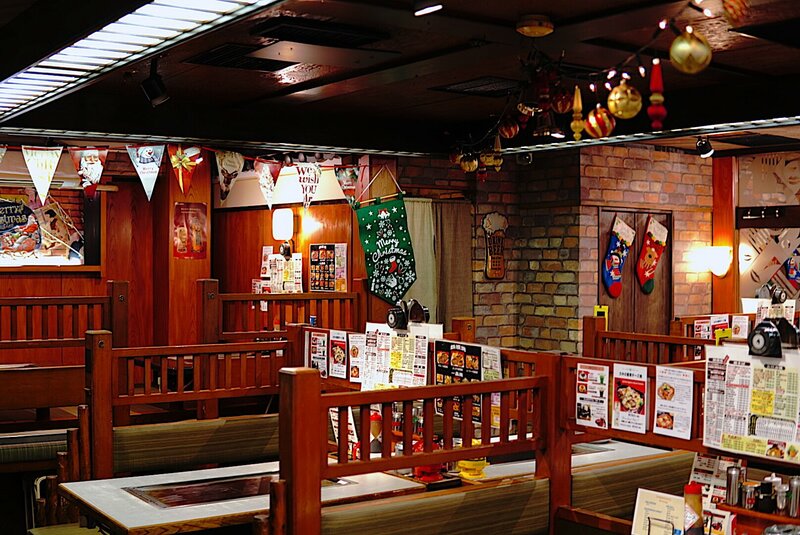 Actually, the soul food of OSAKA “Okonomiyaki” is loved by men and women of all ages!! Many kinds of food !! I immediately took a look at the menu to order. They have regular menu of “Okonomiyaki” and surprisingly curry combo as well. How many kinds they have!! You can find anything you want all the time for sure! 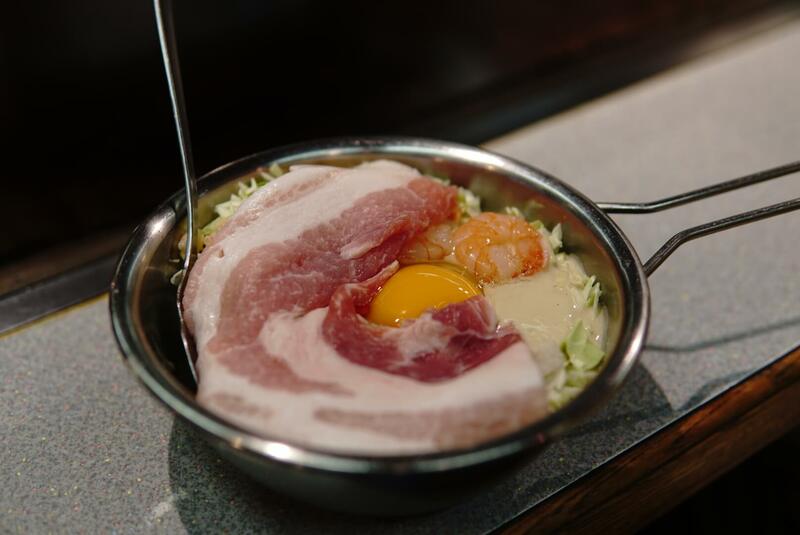 This time, we ordered “Mix Yaki” which has squid, shrimp and pork and “Mochi bacon cheese Yaki” ! We had an interview while making Okonomiyaki in front of us to know how particular they are about it. 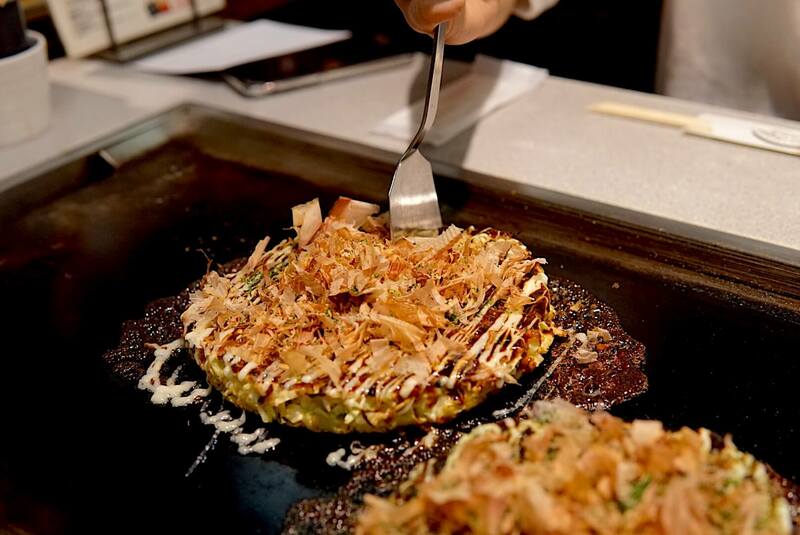 Yoshihiro’s okonomiyaki has less powder than usual ones in order not to make stomach heavy. You can feel each taste of all foods clearly thanks to that! What is this American atmosphere comes from? I was looking around the restaurant while making okonomiyaki. Then I found some certificates of awards. Somehow there is the one in English ! 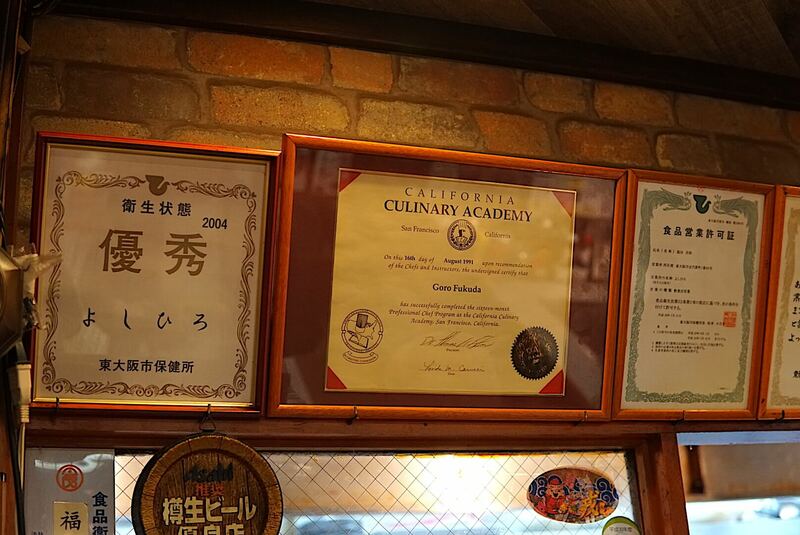 Mr Goro, the owner of this restaurant, went to America when he was 19 years old. Then he graduated a cooking school in there. After graduating, he had been working as a chef. That certificate is like a diploma he got in America. I understood that he can offer not only Okonomiyaki, but also many kinds of food because he has met foods in the world!! Then, therough the 9 years experiences of living abroad and things he faced,he started to think “ Who am I ?”. After that, he got an answer. That was “to succeed his father’s restaurant in Japan”. He said that if he hadn’t been abroad, he wouldn’t have succeeded it. Okonomiyaki got cooked when I thought there are so many things that I don’t know yet in this world from listening his story. After the surface of Okonomiyaki got done brown, put Yosihiro’s original sauce. Then put some bonito flakes on it… and it’s done! To see dancing bonito flakes is also the best part of Teppanyaki! 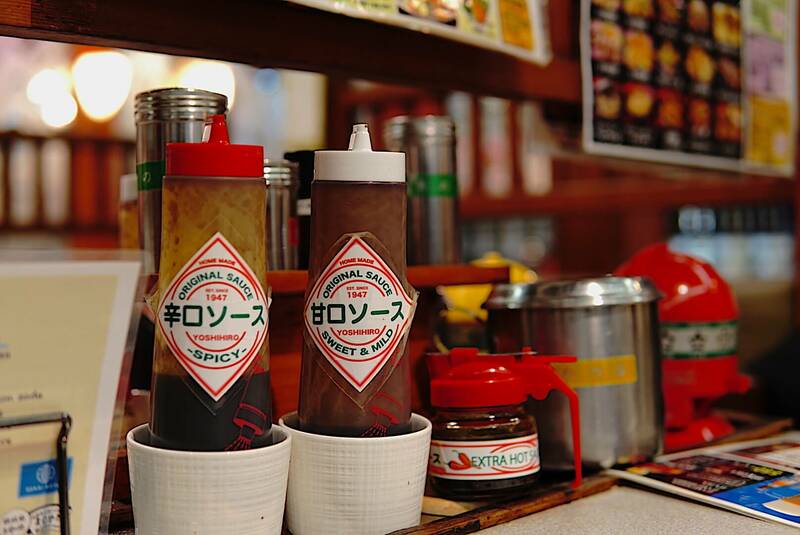 The good smell of sauce and the sizzling sound inspire five senses! Let’s eat it with a small spatula! “Mix Yaki” has awesome crispy pork and plump shrimps!! It’s not that heavy so you can eat all of it easily even if you are a light eater. What I really want to recommend you is “Mochi bacon cheese” ! 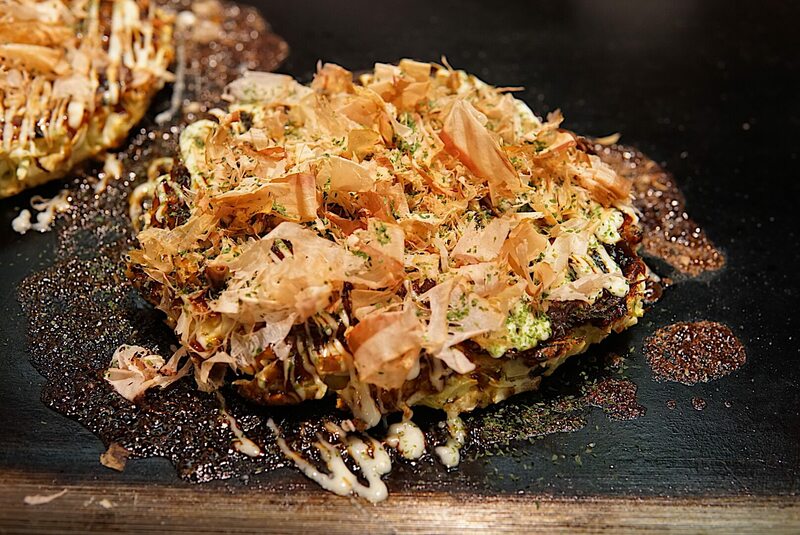 Once you bite it, you’ll enjoy melting chewy cheese in Okonomiyaki. This is really filling. So, if you want to get full by 1 Okonomiyaki, better try it!! 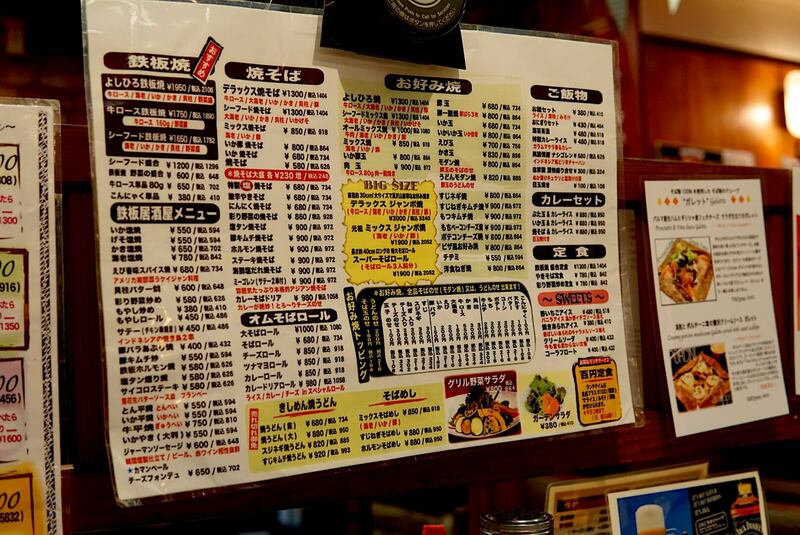 Even Okonomiyaki has 21 kinds so that you can enjoy various tastes!! After eating Okonomiyaki, I found interesting retro fortune telling. 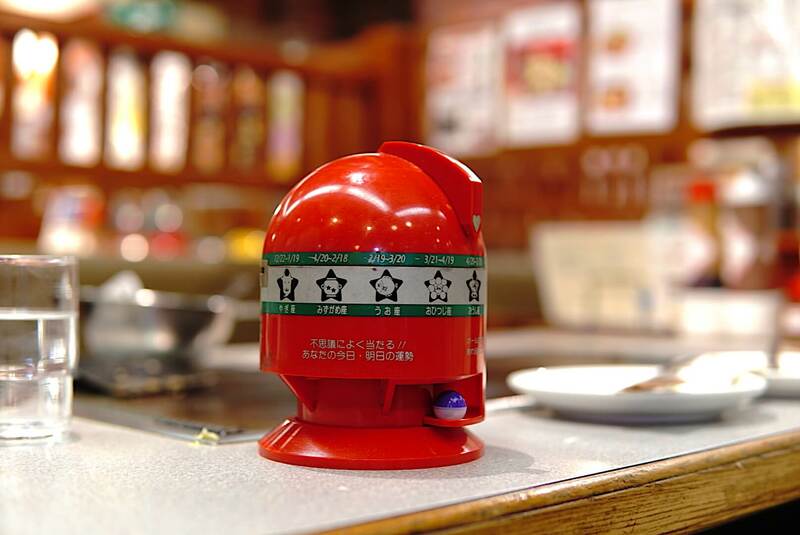 Put 100 yen coin in it and turn the lever. Then it gives you a small capsule. Why don’t you try that? You’ll see how lucky you are!